The year 2016 marked the third consecutive year of steady increases in EU SME employment and value added. 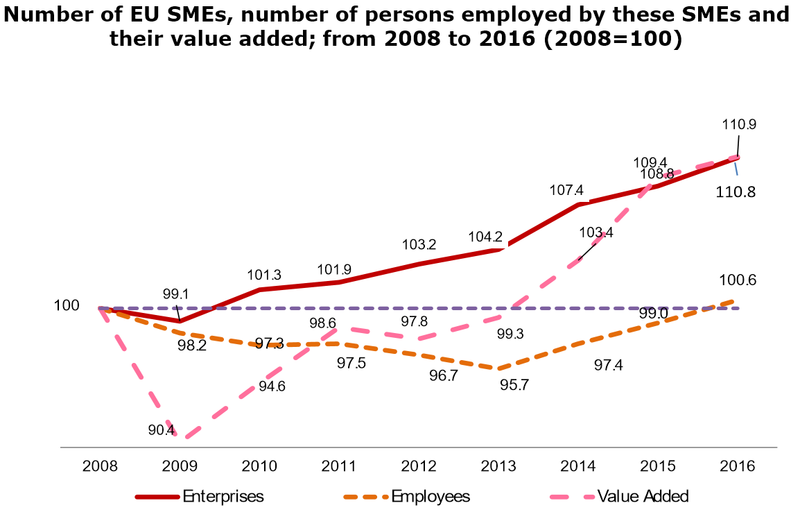 Most importantly, 2016 was also the year in which EU SME employment exceeded the 2008 level for the first time since the 2008/2009 economic and financial crisis. 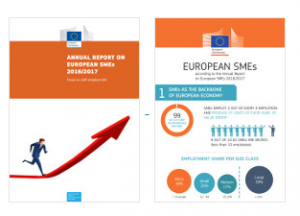 The Annual Report on European SMEs for 2016/2017 shows that SMEs continue to recover. EU SME employment has fully recovered from the 2008/2009 economic and financial crisis and in 2016 it even exceeded the 2008 level, by 0.6 %. The value added generated by EU SMEs showed even greater recovery, as in 2016 it was 11 % higher than in 2008. At sectoral level, the employment recovery in SMEs was most dynamic in services industries. The general macro-economic environment strengthened SME activity in all industries due to the expansion of all categories of final demand (i.e. household and government consumption, exports of goods and services, as well as capital investment by households, governments and businesses). In previous years, the main driver of the SME recovery was exports. In 2016, the recovery encompassed nearly all EU Member States. 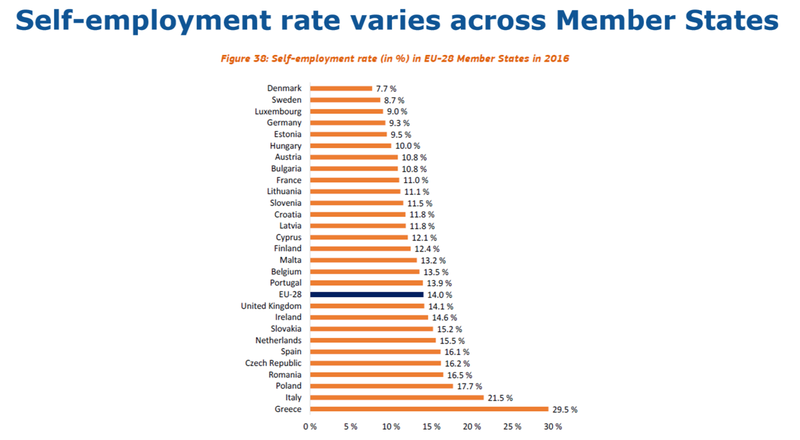 SME employment growth surpassed 3 % in Malta, Croatia, Slovakia, Portugal, Cyprus, Lithuania and Luxembourg, while SME value added increased by more than 5 % in Romania, Malta, Bulgaria, Croatia and Ireland. Latvia did not record growth in SME employment, while Greece and Poland were the two EU Member States that did not see the SME value added increased in 2016. In nine Member States (Austria, Belgium, Finland, Germany, Luxembourg, Malta, Poland, Sweden and the United Kingdom) all three SME performance indicators (number of SME enterprises, SME employment and SME value added) were higher in 2016 than in 2008. In six Member States (Croatia, Cyprus, Greece, Italy, Portugal and Spain), the abovementioned three SME performance indicators were all still below their 2008 levels. The other 13 Member States show only partial recovery in one or two of the abovementioned indicators. Start-ups and scale-ups are important drivers of economic growth. On average, 9.2 % of firms with at least 10 employees in the EU ‘business economy’ were high-growth firms. Over 90 % of newly created firms are born in traditional (i.e. non-ICT) sectors. The approximately 31 million self-employed, accounting for 14 % of total EU employment, have a sizeable impact on the EU economy. A few additional years of solid economy-wide growth will be necessary to leave the effects of the crisis fully behind. EU SMEs are expected to continue their relatively steady pace of growth in 2017 and 2018. Their employment is forecast to increase by 1 % in 2017 and 0.9 % in 2018, while their value added is predicted to grow by 2.5 % in 2017 and 3.8 % in 2018.